This rocker was a find at Home Goods. When the client re-decorated the bedroom in which it was being used, the rocker still met her needs and she had no desire to shop for a new one. We re-upholstered with a grey basket weave fabric that is highly durable, so if rocker ever changes rooms it will likely coordinate with other rooms. Seat cushion was re-wrapped and padding was added to arms. These cornices are the finishing touch to this traditional dining room with touches of Industrial Chic style. Table with accessories added to balance the TV wall. Uplighting warms room for evenings. Window shades that eliminate harsh afternoon glare while filtering soft light into the room. Living Room makeover. Selection of wall /trim colors, furnishings, rug, accessories. Reframed treasured artwork. 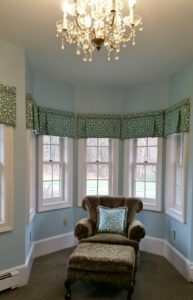 Custom window treatments and pillows. Reupholstered existing chairs. This spot created separately from main conversation area. Custom pillows and reupholstered chairs. Update a Family Room. Organized school portraits. Custom pillows and window treatments. Hunter Douglas “Solera” Roman shades. 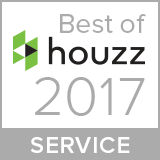 Powerview motorization operated via an app! Bay window with Hunter Douglas “Solera”. Motorized with Powerview app! Lined natural woven panel drape/cornice enhances this organic décor while also providing insulation. Artwork arranged using client’s prized antiques. Custom pleated valance and vertical cell shade to insulate these French doors. Outside-mounted shade completely covers door frame when closed. How to dress a slider? 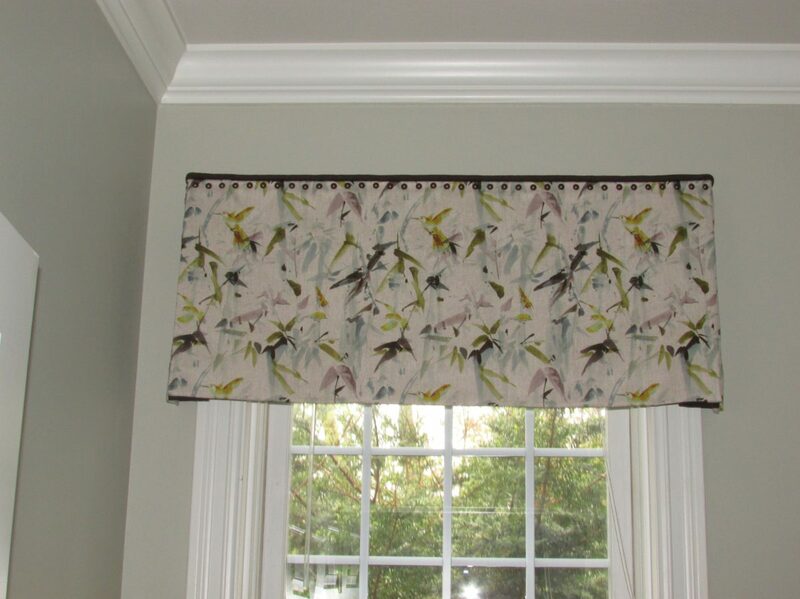 This client says a sheer panel and a valance! Updated this guest bath in a Victorian home with fresh paint colors, custom shower curtain /valance and window shade. Brass shower rod ordered to coordinate with other fixtures. 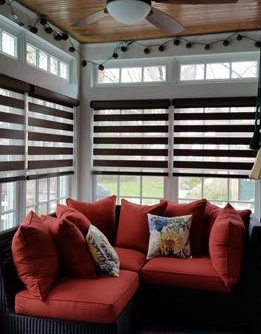 Adding Allure shades brought privacy and protection from late afternoon sun, for a cozy reading space. 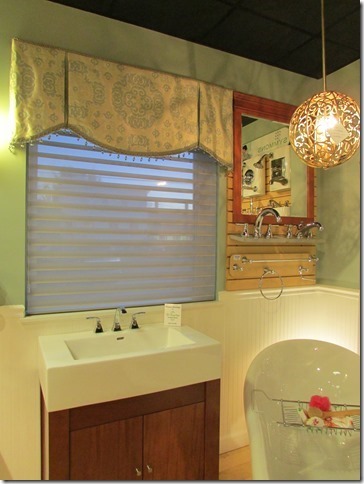 Custom valance and Tenera Shade at a local Bath Showroom. 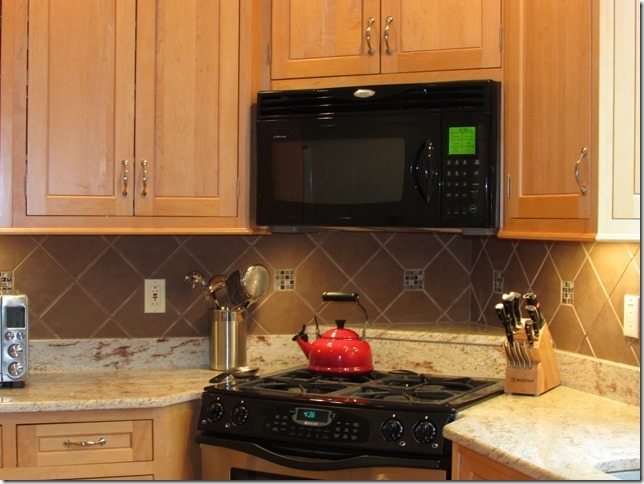 Design and installation of tiled backsplash, unified the cabinetry with the movement in the granite.